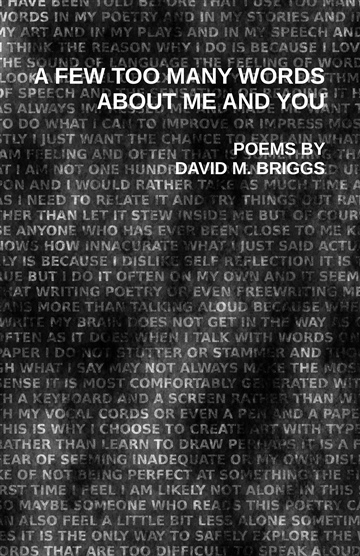 In this short chapbook, Wisconsin writer David M. Briggs collects eight poems about love and music. If love and music are awfully wide categories for poetry, it might be more helpful to say that -- in his winding, yet accessible verse -- Briggs tackles his missteps with relationships by reflecting on his own identity, abuse, and place in the lives of others. There weaves throughout a conversation between an "I" and a "you", a call and response of shifting sounds and styles. And much like the writing within, some may think this description already contains a few too many words. 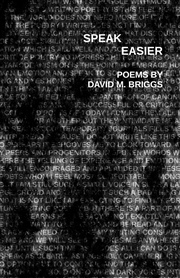 David M. Briggs is a writer from Wisconsin. If that sounds a little vague, it is. Unfortunately, it is a little difficult to be more specific. Briggs is originally from an area outside of Milwaukee that intersects with too many different townships to be easily named. Likewise, his writing covers poetry, prose and playscript and is often too true to be entirely fiction and too fictionalized to be entirely true. In his writing, he tackles experiences with queer identity, mental disability, and the urge to fall in love more frequently than wisely. Throughout his work, he strives to find a place for himself between a past too grand to stand on and a future too shifting to build in. Somewhere in the middle, then, must be an understanding that fits. Briggs seeks to find it with a mixture of self-deprecating humor and determined defiance. His poetry and prose have been published in literary journals nationwide, including Polychrome Ink, Red Cedar, Straylight, The Catalyst, and Steam Ticket: A Third Coast Review.